We’ve touted the benefits of each of the types of flooring that we offer, and vinyl is no different. In fact, it holds a special place in our heart, because it’s the newest as far as time on the market, and we happen to be experts at trends in the flooring solution market. Schools- It’s not just the versatility of vinyl that we love, it’s the durability and the low-maintenance care. And where in the world do you find a business more deserving of low-maintenance care? Teachers these days are too busy shaping the minds of our youth to be able to focus extensive amounts of time on cleaning up messes and spills on the floor. So vinyl is a natural fit. Easy to clean and care for, and safe for our little ones to run around on. The Hospitality Industry- It’s just a nature of the job for food and drinks to make their way to the floor. This is another example of where the low-maintenance care comes in handy. 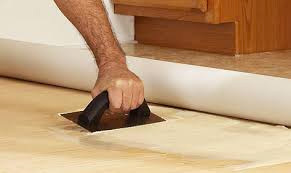 The vinyl in the kitchen of your home or throughout your property won’t need to be changed out frequently. We make sure that all of the styles that we carry are here for the long haul. Entry Areas- You may think that we’re just exploring a trend of areas that see a lot of floor dirt. Sure, vinyl does work well in every area with that criterion. However, the other nice thing about vinyl flooring (one of a few) is that it can be finished with any look under the sun. Are you looking for a wooden look? Vinyl can help. Are you looking for a marble look? Vinyl can help. Excepting the soft and furry carpet end of the spectrum, vinyl will meet the aesthetic of pretty much anything that you can throw at it. Interested, but not sold? We welcome you with open arms. Every team member at Knox Carpets is both educated and passionate about vinyl flooring, as well as every other product option that we carry. That means that you can reach out through any communication medium of your choosing. We will ensure that we respond in a timely manner and are able to provide you with both answers to your questions and resources to learn more. We aim to make you as passionate about the consumer journey as we are, when it comes to talking flooring solutions.